For a variety of reasons, insomnia is a fairly common problem these days. From stress and anxiety to wound up tension to depression to the brain that will just not stop thinking long enough to find sleep… there are a lot of reasons why that important period of recharge can be elusive. In my own battling with insomnia, I found tranquilizers to be frustrating. I disliked the sensation of not feeling as if I would be able to wake up, if I needed to, and many of them seemed to provoke a “hangover” effect the next morning, where I just couldn’t seem to shake off the effects. 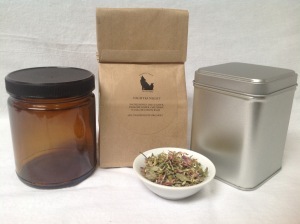 This tea was formulated to make finding sleep easier, and to ease some of the causes for insomnia, while avoiding the added effects of tranquilizers that I found to be frustrating. The primary herb in this tea is scullcap. It acts directly to counter the feeling of sleeplessness, while inducing calm and relieving tension. Over time, scullcap will work as a tonic to build your resistances to stress and tension, making insomnia, anxiety, and tension-induced headaches less frequent or less intense. 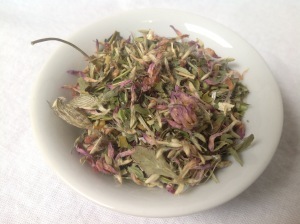 As many of the causes for insomnia can be exacerbated or triggered by nutritional deficiencies, two nutritives were chosen for this tea – Red Clover and Oatstraw. These two herbs also share a general calming effect, helping to soothe nerves. Oatstraw also works as a mild anti-depressant, in part due to the amount of B vitamins it contains, thus assisting to ease another of the common contributing factors of insomnia. Lemon Balm acts on both the mind and the nerves, working to soothe and calm. It is also a mood lifter, helping to disperse the negativity that can come with stress. This tea should not be used during pregnancy, while nursing, or by children. We have a blend that is pregnancy and nursing safe, and a version for children as well. This entry was posted in Medicinal Teas and tagged Herbs for Insomnia, Herbs for Sleep, Insomnia Tea, Organic Herbal Tea, Organic Lemon Balm, Organic Medicinal Tea, Organic Oatstraw, Organic Passionflower, Organic Red Clover, Organic Scullcap, Organic Tea, Tea for Sleep by DesertSage. Bookmark the permalink. My mother and I love this night time tea! NighTea Night helps in decreasing lingering daytime anxious feelings and increasing relaxation! Another benefit is a general calmness that the tea gives you. Fastest Shipping ever! NighTea Night is very soothing and helped me relax from a stressful day. Calming! Kei-Hawk goes above and beyond with helpful information and sincere emails.